WHY DID GOD CREATE SEA TURTLES? ARE THEY REALLY IMPORTANT TO MAN? Sea turtles are considered to be reptiles that live most of their lives in the sea though they come out every year to lay their estimated 50 to 350 eggs in nests dug along the shores of the sea for procreation. Currently, seven species can be identified, including the green, loggerhead and the hawksbill. If sea turtles were created by God, why did He do so? Are their presence in the sea so important for them to be created in the first place? According to dictionary.com “A jellyfish is a creature belonging to the phylum Cnidaria, a zoological category of aquatic animals known as coelenterates or cnidarians, which also includes corals and sea anemones.” A sting from jellyfish is painful and may leave telling marks on your body. Out of the close to two thousand varieties of jellyfish, only a handful is deadly, like the box jellyfish. Jellyfish feeds on fish larva so if they consume lots of fish larva, the population of fish would decline and fish protein in human diet would diminish. Jellyfish serves as food for the leatherbacks type of sea turtle and lots of them are eaten as a meal. The sea turtle is therefore important in the sense that it helps to control the population of jellyfish in the oceans and consequently maintaining the stock of fish in the waters. Another way in which the sea turtle is important is the fact that green sea turtles feed on sea grass. In order to ensure that the sea grass bed is healthy, the sea grass must be kept short to allow it to spread across the length and breathe of the sea floor. The green sea turtle which feeds on the sea grass ensures that the sea grass is constantly kept short so the grass can spread across the sea bed. 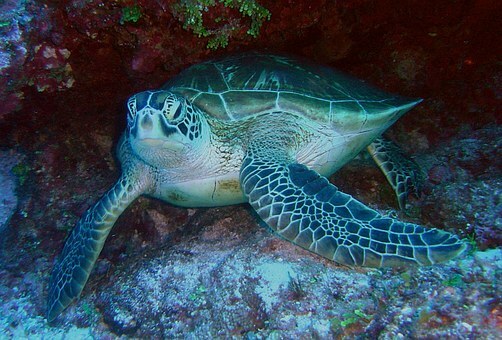 In other words, the green sea turtle helps to maintain the health of the sea grass bed. They are the mowers of the sea floor. The beaches and lower dunes of the sea coast are so fragile that they could be eroded by the very sea. Something needs to hold the sand together and that is the coastal vegetation. Sea turtles lay their eggs at the beaches in holds dug as nests. After the gestation of the eggs, some of them hatch and others do not. Those that hatch must find their way back into the sea. As they journey into the sea they are preyed upon and others die before they get into the sea. As said earlier, a sea turtle can drop between 50 and 350 eggs per season. The decomposed egg shells and the dead hatchlings return into the soil to serve as nutrients for the vegetation at the coast. The presence of the vegetation and its roots are able to hold the soil together and therefore erosion is slowed down. The hawksbill sea turtle which inhabits coral reefs feed on sea sponges. In the absence of hawksbill sea turtles, the sponges in the sea could outgrow the coral reefs especially the slow-growing ones and thereby kill them. The presence of the sea turtles therefore help to control the presence of sea sponges on the sea bed. As part of the food chain in and outside the ocean, sea turtles serve as food to a variety of prey. In some communities, people are able to identify the turtle nests on the shores and are able to take some eggs for their personal use at home. When the eggs hatch, before they have the chance to swim into the sea, some serve as food to birds, fish and other mammals. The adult sea turtles serve as food to sharks. Human beings also use meat from sea turtle as food. So another way in which sea turtles are important is because they serve as food. Eco-tourism is a niche area in tourism today. It combines the preservation of animal species with tourism. Tourists are ready to pay good money to watch animals in their natural habitat. Countries are able to harness the population of sea turtles in the sea and people are taken there to watch them. This serves as a source of income for the community in particular and the country at large. If the sea turtle are this important to the human race, then their depletion is going to cause a lot of imbalance in the oceans and affect the lives of human beings. What can you do to help control the rate at which the sea turtle population is reducing in the Oceans? Share your views with us. English-speaking West African degrees now to the dogs?